On rush orders, we can also handle your Next Day, Second Day or 3-Day Select requests. Simply provide your UPS, FedEx Ground account number. Every major shipping carrier serves Woodbridge. We are knowledgeable about shipping rates and carriers to different parts of the country and world. Our Shipping Department is very experienced and works to make sure the shipment goes by the most economical carrier. 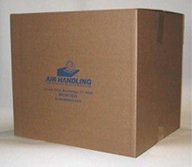 Air Handling Systems ships products worldwide on a regular basis. Please forward your list of material and location of freight forwarder in the United States. We will quickly provide a quotation including the freight cost to US forwarder. It is the responsibility of the customer to arrange transit from that freight forwarder to their international location. Size and weights of shipping cartons will be provided. All necessary export documentation will accompany shipment. View more information on Air Handling Systems International. 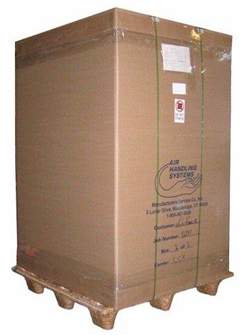 Average shipping costs for parcels shipped via UPS or FedEx Ground from Air Handling Systems, Woodbridge, CT.
Average costs are for Commercial addresses, Residential addresses will incur additional shipping charges. 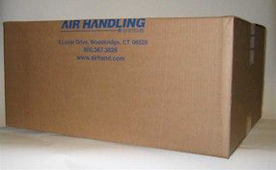 Standard Boxes for UPS and FedEx Ground shipments. 15″ x 11″ x 13″. Designed for small parts such as blastgates, small elbows, couplings, and reducers. 15″ x 13″ x 25″. Our shipping department uses this box for access doors, lateral tees, and other medium size fittings. It’s also perfect for vacuum hose kits and 25′ lengths of 3″ flexible hose. 28″ x 25″ x 26″. 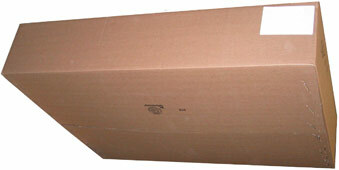 This is the one of the largest boxes we have that can ship via UPS or FedEx Ground. We commonly ship 25′ lengths of flexible hose in 5″ and 6″ diameters or up to 50 foot lengths of 3″ or 4″. Don’t exceed 50lbs. Package must not exceed these dimensions. 28″ x 25″ x 16″. Perfect fit for 12′ 6″ lengths of UFD, RFH and AH2P in 4″ and 5″ diameter flexible hose. 44″ x 33″ x 10″. Fits 25′ lengths of 6″, 7″, and 8″ RFH. Package must not exceed these dimensions. 13″ x 13″ x 61″ – Perfect fit for 5′ lengths of spiral pipe. Can be used for single pieces of 7″-10″ or multiple pieces of 3″-6″. Will also fit 10U30-C15. 17″ x 17″ x 61″. A larger version of our pipe box. Used for single pieces of 12″-16″ or multiple pieces of 5″-8″. Will also fit 12U30-C15. Please note: Larger boxes and crates are designed for truck orders shipping via common carriers. Large Box and Skid 42″ x 36″ x 60″ – Designed for larger orders shipping via common carrier. 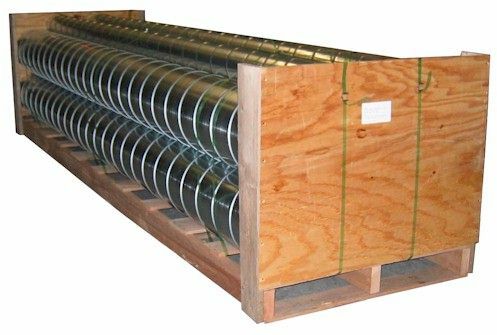 Crate 30″ x 120″ – Designed for shipping spiral pipe via Common Carrier.